Expect to be in the South End around 10:30pm on a Friday or Saturday night with nothing but time to kill? Between now and August 8 you can catch Rick Park and John Kuntz at the BCA in After School Special. If you've been to the theater in Boston in the last 10 years, you've almost certainly seen one of these two on stage. The play follows the trials and tribulations of a perky teen-age girl who, in order to save the life of her faithful dog, must become wicked popular. Along the way, she outwits the school bully, befriends nerds, defies her sociopathic mother, discovers her true secret identity, and figures out who is killing all the contestants in the high school beauty pageant. At least that is the official synopsis. And what would you be doing in the South End at that time of night? Earlier in the evening at the BCA you could take in Assassins. This Stephen Sondheim musical attempts to explore the motives of nine individuals from John Wilkes Booth to John Hinckley who have attempted to assassinate an American President. I’m not sure this revival of the 1990off-Broadway hit and 2004 Broadway hit is a good idea. For me, it brings up bad memories of a long and not terribly funny story about Leon Czolgosz and the assassination of President William McKinley in Buffalo, New York that Rick Jenkins used to tell at the Comedy Studio in Harvard Square. 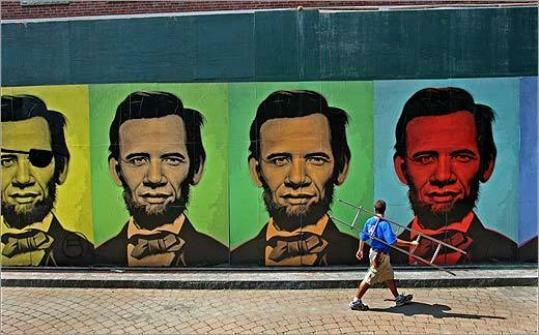 You could also wander down to Harrison Avenue to view the controversial mural by artist Ron English featuring mash-up portraits of Barack Obama and Abraham Lincoln. What to do? Attending would require crossing over to the other side of the Charles River, 10:30pm is after my bedtime, and I'm not sure I'm ready to be investigated by the Secret Service. OK, I'm game. I remember long boring trips to various assasination related sites as a kid growing up in Buffalo, but I don't remember my STORY about it...maybe I'm getting better. For much funnier research check out Sarah Vowell's "Assasination Vacation".